Apple’s new iPad is good but not as we expected! It has a virtual keyboard and can be viewed in landscape or portrait mode. It has a built-in photo viewer, calendar, address book, maps, YouTube, and QuickTime movies and TV shows. You can browse the New York Times and check out photos, zoom in and zoom out. You can use it to view Adobe PDFs. The keypad looks like it is quite easy for typing, since the keys are large and the keyboard view takes up about half of the screen size. iPad syncs just like an iPhone or iPod & the Keyboard dock for the iPad – so you can use like a desktop PC. iPad compatible with all Apps, Apps can run in iPhone scaled or pixel doubled mode to make them fit to the screen. iWork is coming to iPad! This takes the device into a completely different realm – starting to look a bit brighter for the iPad. What is in it ? WIFI models available worldwide in 60 days and 3G versions 30 days after that. 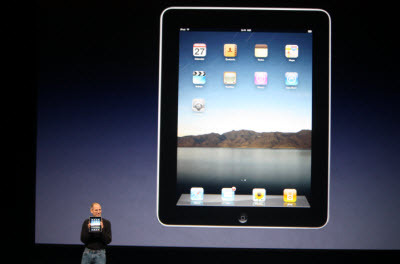 iPad 3G models will be carrier unlocked. FBI on Facebook Twitter yourtube & other social Meadia?